1. To promote a concerted nation-wide effort to set up a sufficient Legal Defense Fund for Peter Liang. 2. To organize a powerful legal team composed of some best legal defense lawyers in the nation. 3. At the same time, try multiple ways to gain support from elected officials and campaigning candidates. 4. To reach out to other ethnic communities and to seek their understanding and support. One Tragedy, Two Victims ! Condolences to Mr. Gurley's Family ! Equal Justice, No Scapegoating ! Say NO to Selective Prosecution ! Fair Trial for Peter Liang ! NYPD Bears Undeniable Responsibility ! NCCA calls Chinese Americans and all Chinese people around the world to embrace science and reason in our daily life, recognize and enhance our cultural heritage and historic perspective, and strive to make a greater contribution to the dignity, progress and peace of the world. Congratulations to China and her people! December 17 of this year marks the 67th anniversary of the U.S. Congress’ repeal of the Chinese Exclusion Act (1882-1943), a discriminatory law that had banned Chinese immigration, excluded Chinese Americans from broad civil liberty, and shut down our community growth in the U.S. for more than 60 years. Even today, although with all of its constituent sections repealed, Chapter 7 of Title 8 of the U.S. Code is still headed, “Exclusion of Chinese.” It was racially prejudiced for the Federal government to completely focus on and against a specific nationality or ethnic group. The National Council of Chinese Americans (NCCA) (www.myNCCA.org) and people (not just Chinese Americans) in our community strongly urge you to introduce and/or co-sponsor congressional legislation to apologize to Chinese American people for the Chinese Exclusion Act and, more importantly, to establish the day of December 17 as the “National Day of Inclusion,” to promote diversity, tolerance, and forward-thinking. In recent years, there has been a wave of official apologies in the U.S. and around the world: the U.S. Congress has made apologies to Japanese Americans with $1.6 billion reparation for the WWII Japanese Internment, to Hawaiian Americans for the “illegal overthrow of the Kingdom of Hawaii in 1893,” to African Americans for injustice, cruelty, and the inhumanity of slavery and Jim Crow, and to native Americans for historic violence, brutality and injustices. The Canadian government expressed apologies to Chinese Canadians for imposing unequal taxes on them; Australia apologized to its Aborigines and Chinese Australians for racist laws of the past. Americans, Chinese Americans included, begin to contemplate with “the question of a citizen”: Is a congressional apology to Chinese Americans unnecessary or not enough? Our study indicates that the majority of Chinese Americans and many other American people consider such an apology necessary. The reason is that under God, a civil and humane society, such as the U.S., has the duty to recognize its fundamental injustices of the past and address them and/or their consequences today, and to discourage the occurrence of similar injustices in the U.S., and furthermore, to make more credible and sincere any declaration of concern by the U.S. over violations of human rights committed by other nations. A congressional apology to Chinese American people for the Chinese Exclusion Act will mark the official recognition of Chinese Americans’ historic contribution to the construction of the Transcontinental Railroad, the transformation of the Civil War-era West Frontier into agricultural land, the post-Civil War’s Industrialization, and America’s full-spectrum nation-building ever since. The National Council of Chinese Americans and many people in our communities have come to the conclusion that our nation needs to move beyond apologies. We need to establish the day of December 17, the date that the Chinese Exclusion Act was repealed, as the “National Day of Inclusion,” so that all Americans can join hands in respect and reconciliation with each other and build an even more spectacular America! Examining world history, one can see that every world power must harness the energy of pluralism and tolerance, and attract the talents that are excluded in other societies around the world. Sobering examples of intolerance and exclusion are Nazi Germany and imperial Japan: however powerful and technically advanced they were, both systems failed to attain and retain super-power status as a direct result of racial, religious and social intolerance. It is obvious that America’s success has been, and will continue to be, reliant upon America’s unsurpassed ability to attract immigrants, partially through the political framework outlined by Thomas Paine’s notion of “Independence and Democracy” and Woodrow Wilson’s concept of “the League of Nations.” This is especially true today in the post-9.11 era: to avoid reaching the so-called “tipping point” of decline, America must embrace inclusion and innovation at a scale that is grander than ever before. This is an historic calling. 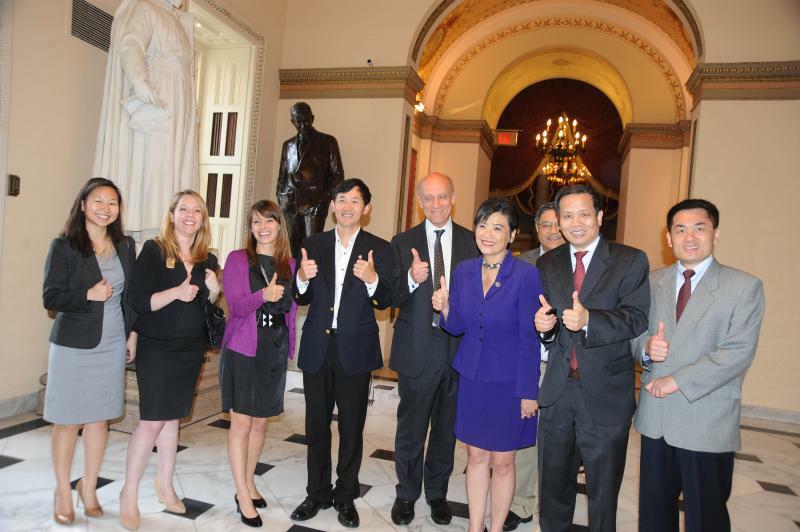 The National Council of Chinese Americans and others in our community are looking forward to working with you on the congressional legislation. We have faith in your kindness, wisdom and vision. Thank you very much. NCCA Organized large Concert and Controbutes more than $16,000 to American Red Cross's Katrina Relief Effort. (click following link for News&Observer report.